Sodium—one of the elements that make up table salt—could soon make cellphone batteries much cheaper and cleaner. That's the goal of Chongwu Zhou, a professor of electrical engineering at the USC Viterbi School of Engineering. Today's cellphones use lithium batteries for power. Sodium could be a better option for batteries than lithium, according to researchers—but there's a problem. Current technology stores lithium ions in graphite (a soft mineral made of carbon), but sodium ions are too big to be stored in graphite. The groundbreaking result: wavy sheets of so-called "nanodots" that could store and release sodium ions. In practical terms, their creation could bring sodium-ion batteries into reality. Sodium is better than lithium in a lot of ways. It's much cleaner than lithium, which contributes heavily to climate change and pollution. Because of its abundance, sodium is also cheaper than lithium, which must be mined. And you can't line the top of your margarita glass with lithium. 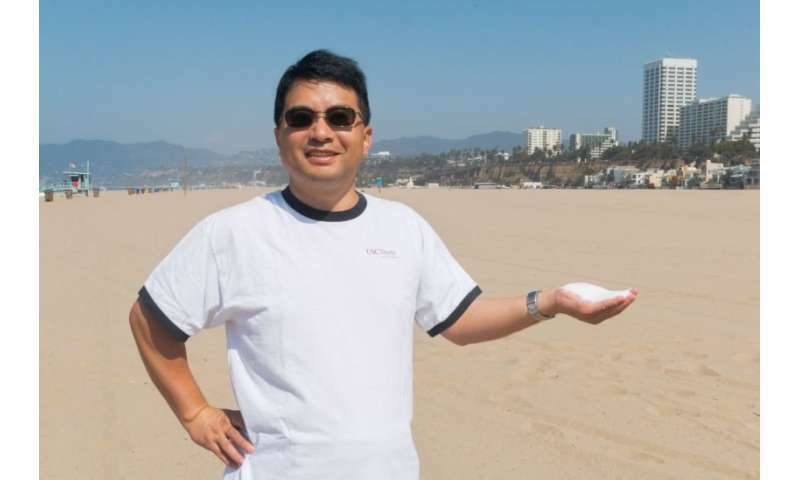 "Imagine being able to walk right up to the ocean just a few miles from here," said Liu, "and get all the salt you need to manufacture all the world's cellphone batteries." To the delight of smartphone addicts, Zhou's sodium-ion battery can be charged to 50 percent capacity in just two minutes. But don't rush out to buy it yet. The next step for Zhou and his team is to improve the performance and life of their battery so they can bring it to market. Collaborators include researchers from Tsinghua University in Beijing. The team's work was published in ACS Nano. Red phosphorus?? I had visions of batteries becoming fireworks or striking batteries to light them, but I guess that's mostly white phosphorus. Wikipedia says RP is actually used as a flame retardant, certainly a Good Thing if it retains that property in batteries. >Red phosphorus is used in the making of methamphetamine (meth), an illegal drug. >In this process, red phosphorus is mixed with iodine to produce hydriodic acid.